Siege #4, the last issue of Marvel’s latest crossover, came out yesterday. For those not keeping score, Norman Osborn, aka the Green Goblin, has been the “top cop” in the Marvel Universe for a while now, basically running everything with the help of a secret cabal that included Dr. Doom, Loki, and some other baddies. Siege brought all that to an end, with Osborn overreaching the limits of his power by invading Asgard (home of the Norse Gods and what-not), leading to his inevitable downfall. The Siege storyline was fun, a bit different from the usual crossover, though the end was somewhat anti-climactic. But then crossover endings are almost always anti-climactic, and writer Brian Michael Bendis’s strength has always been small, funny, and sometimes poignant moments of (super)human interaction, much more so than the big battles. Maybe it’s the geek purist in me, but I do wish there had been a bit more of a role for Spidey in this one. The Green Goblin *did* come to us from Spidey’s rogue’s gallery, after all. One of my favorite things about Dark Reign has been that Cap and Ms. Marvel and all these big-shot Avengers are all, “OMG, the villains are in charge of everything in our lives, this is the worst thing EVAH!” And Spidey basically says (1) Welcome to my world; and (2) Don’t worry, Osborn will shoot himself in the foot eventually, trust me, he always does. It was really fun watching Spidey school the other super-heroes on how to handle being the underdog, and a big part of me wanted him to have a moment of standing over a defeated Osborn saying, “See, told you so.” Maybe that’ll happen in the first issue of the New New Avengers re-launch or whatever they’re calling it. But, more than anything, some part of me is sad that the super-villains aren’t in charge anymore. It’s just so much more fun when the villains are on top. (See also the original Star Wars trilogy, Lex Luthor’s tenure as president of the United States in the DC Universe, or the many Cylon victories in BSG.) I suspect there are several reasons why it’s appealing when the villains have the upper hand, among them, (1) it gives the heroes a bigger and more interesting challenge, almost always a good way to go; and (2) at some level, don’t all of us occasionally, secretly identify with the villains, and want their crazy schemes for world conquest to succeed? Who wouldn’t love for poor Brain *just once* to succeed when he tells his friend their plans for the evening: “The same thing we do every night, Pinky. Try to take over the world.” Seriously, I’d pay a lot of money to see an episode where Brain succeeds. Among other things, I’d like to know, What would Brain do next? How would humanity feel about their rodentia overlord? What would Pinky’s role be in a Brain dictatorship? Etc. With stories like Dark Reign, we get to see both heroes and villains react to situations we haven’t normally seen them in before – especially refreshing in the comic book sphere, where so many stories and battles get recycled. So, I’m already starting to miss Norman Osborn and his much-maligned hair-do. 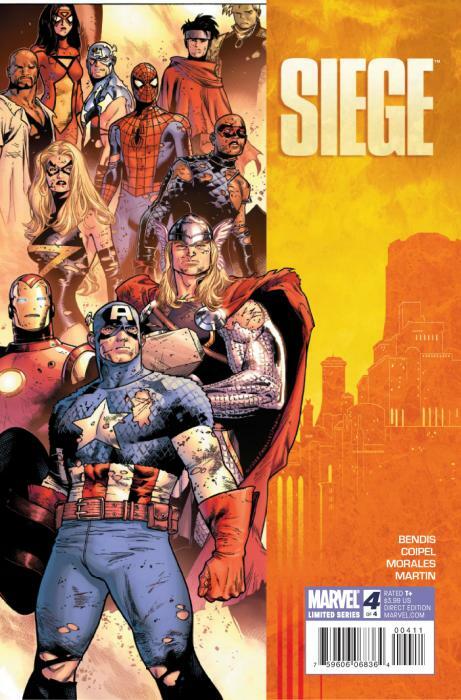 “The Heroic Age” storyline that begins immediately after Siege doesn’t seem to have nearly as much dramatic potential, though I am somewhat interested in the idea of Steve Rogers (Captain America) being in charge of SHIELD instead of Nick Fury. I’m hoping it turns out to be much harder than Cap suspects, as he discovers that negotiating politics and changing a large-scale bureaucracy and the like are much harder than punching out the Red Skull – an apt storyline for the current age. This entry was posted in Comics, Pop culture and tagged Captain America, Dark Reign, Heroic Age, Norman Osborn, Siege, Spider-man by benfrancisco. Bookmark the permalink.